calcium rich dals. calcium rich kadhis. From the humble, Gujarati Kadhi to the exotic Healthy Kofta Kadhi , from simple Palak Kadhi to more sumptuous Teen Ratna Dal, there are umpteen ways in which you can prepare our all-time favourite dals and kadhis. 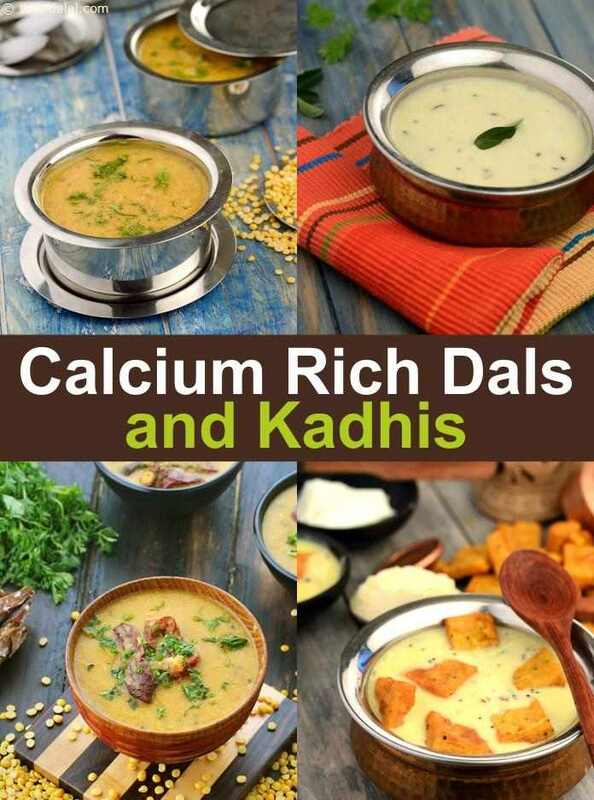 Open this section to discover a treasure-trove of Calcium Rich Dals and healthy calcium rich Kadhis, which are not only irresistibly tasty but also easy to make, offering you another interesting way to enhance your calcium-intake. Let's start with Dahiwala Toovar Dal which is made with low fat curds and toovar dal which are both high in Calcium. Then there is the Palak Kadhi which is a low carb kadhi that is high in calcium. From Gujarat, you have the ever famous Gujarati Kadhi which is made in every Gujarati household and had with puris or rice. Then from Rajashtan there is Rajasthani Pakoda Kadi with its famous pakodas inside the kadhi and the Pithore Kadhhi. From Punjab is the Low Calorie Dal Makhani which is loved all over India. Moving South from Hyderabad is the Hyderabadi Khatti Dal. Also the ever famous Sambhar which is had with Idlis and Dosa. There are lots of Calcium Rich Recipes on our site and most important is to know your list of Calcium Rich Foods and last but not least know your Daily Calcium requirement from Adults to kids. Love your write up and collection of Calcium Dals.